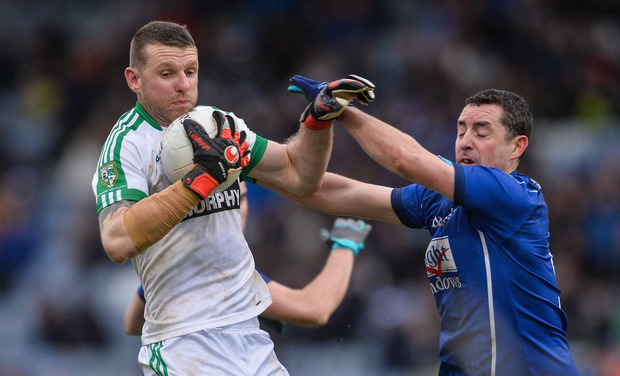 A sensational late comeback saw Moorefield crowned Leinster club football champions today in Portlaoise. Trailing Westmeath side, St. Loman’s by six points with just six minutes to play of a gruellingly physical game they appeared to have lost from a position of superiority, the Kildare champions somehow mustered 1-4 in the breathless closing stages to secure the second provincial title of their history, and just a third ever for Kildare clubs. Moorefield were overrun in the second-half but found the scores when required despite looking dead and buried. Three Éanna O’Connor frees sandwiched a goal from veteran Ronan Sweeney after a brilliant run and pass from Moorefield’s hugely impressive centre-back, James Murray, and with everyone in O’Moore Park expecting extra-time, Moorefield were awarded a free five minutes into injury-time. Referee Barry Tiernan moved it up to the ’45 for dissent from Loman’s sub Billy O’Loughlin and though O’Connor skewed his effort, Sweeney managed to keep the ball alive and it found its way to Kevin Murnaghan, who spun and kicked the winner to rapturous acclaim from the Moorefield support. Previously, Moorefield had been decisively the better team in the first half. They detailed David Whyte – a late addition to their team – to mark John Heslin and after half an hour, the Kildare man was well ahead in their personal battle. Mostly, Heslin floated out around midfield but stayed on the periphery of St. Loman’s attacks and save for one, albeit beautifully struck, point off a quick free, his influence on the half was negligible. Moorefield’s tackling was excellent too. On three separate occasions in a ragged opening passage, the Kildare champions repelled Loman’s attacks with sharp dispossessions and up front, they possessed a more pronounced threat. Éanna O’Connor kicked four points in that first half, two from play. And just as in their semi-final win over Rathnew in Aughrim, thrived off the ball his inside partner, Niall Hurley-Lynch, won. After feeling each other out early on, Moorefield went on a run of four points without reply, including a rampaging fisted score from veteran, Ronan Sweeney. And in truth, their 0-7 to 0-4 half-time lead didn’t accurately reflect Moorefield’s superiority in that period. That all changed in the blink of an eye once the second half started. With forwards, Ken Casey and Ronan O’Toole increasingly prominent, Loman’s turned the game on its head. Within eight minutes, they were three points up. Casey slipped a ball past Tom Kinsella for their first goal in the 38th minute after a long pass from Kelvin Reilly broke kindly. In midfield, Paul Sharry began bossing proceedings and Loman’s managed to pin Moorefield into their own half for long spells. They also wore their opponents down with incessant running from deep. With Moorefield’s forwards increasingly starved of ball, Loman’s thrived and when O’Toole struck their second goal in the 54th minute to put them six up, the title looked to be heading to Mullingar. Cue Moorefield’s amazing Houdini escape. SCORERS – Moorefield: É O’Connor 0-8 (5f), R Sweeney 1-1, J Murray 0-2, K Murnaghan, E Heavey, D Whyte 0-1 each. St. Loman’s: R O’Toole, K Casey 1-2 each, P Sharry, J Heslin (1f) 0-2 each, K Reilly, S Dempsey 0-1 each.